The Central Government provides for environmental protection by ensuring safe management, handing and disposal of biomedical and radioactive waste. Biomedical waste means dry solid, fluid or liquid waste including its container and any intermediate product, which is generated during the diagnosis, treatment or immunisation of human beings or animals in research including the animal waste from slaughter houses. Disposal means discharge, deposit, dumping, land filling or placing on land of any biomedical waste. There are persons and organisations responsible for these activities. The authorised persons include incharge of a hospice such as hospital, nursing home, clinic, dispensary, laboratory, health centre, animal house, slaughter-houses including those established by or under the control of government, which generates and handles any biomedical wastes. 1. Biomedical waste includes which of the following ? 2. Safe disposal of hazardous waste is necessary for which of the following reasons ? 3. Disposal of waste refers to which of the following ? 4. Nursing homes, laboratories, animal houses and slaughter houses are responsible for which of the following waste related activities ? 7. 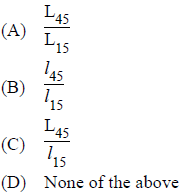 Which one of the following is not correctly matched ? 11. 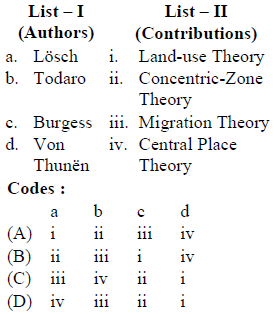 Maximum life-time male migrants in India are observed in which of the following streams ? 22. 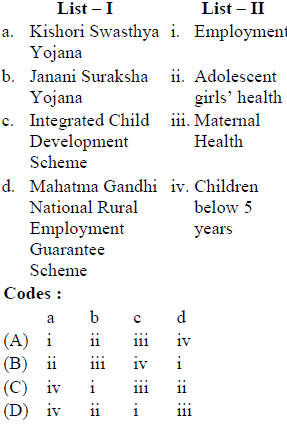 Which among the following year Government of India conceived the Annual Health Survey ? 23. Assertion (A) : There are many environmental issues in India namely air pollution, water pollution, garbage disposal and high rate of growth of the country’s population. Reason (R) : Economic development and high rate of growth of the population is causing environmental issues. 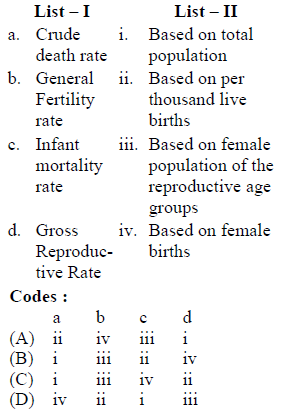 24. Who among the following proposed Wealth Flow Theory in the area of fertility ? 26. Who among the following has written the book ‘Population Bomb’ ? 37. What is ‘Kyoto Protocol’ ? 43. Which is the most literate district in India ? 44. Which is not a part of the goals of National Population Policy 2000 ? 46. Which of the following is the primary component of Janai Shishu Suraksha Yojana ? 47. Which among the following States has the lowest maternal mortality ratio ? 48. Which among the North-Eastern States of India has the highest fertility ? 50. According to 2011 Census, which of the following is the most urbanised State in India ? 51. ‘Health for All’ Declaration was signed in which city ? 53. 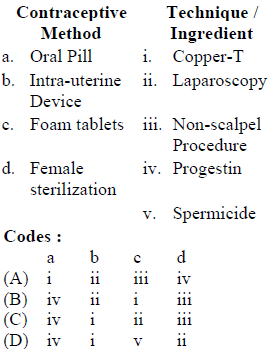 Which of the following is not related to the study of fertility ? 57. Which of the following is not a goal of National Rural Health Mission (NRHM) ? 60. 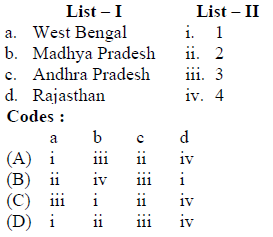 Which of the following types of errors were evaluated in the Post Enumeration Survey (PES) of 2011 Census ? 61. 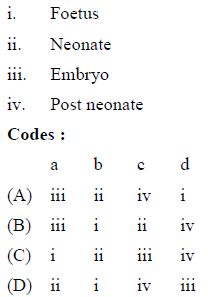 Which of the following is not an element of Intermediate variables in fertility analysis ? 64. National Health Policy was adopted in India in which of the following years ? 65. When was the National Forest Policy formulated for the first time in the independent India ? 66. NACO is an organisation which deals with which of the following health concerns ? 67. Which of the following services are not provided by the Anganwadi Centres ? 68. As per the norms for the health facilities in India, what population size should be served by a Primary Health Centre (PHC) in hilly and tribal areas ? 69. Assertion (A) : There is a decline in the number of families living below the poverty line in India since the last two decades. Reason (R) : Per Capita Income in India has increased during the last two decades. 70. Assertion (A) : Human loss and damage to property due to flash floods has become common in the Himalayan belt. Reason (R) : Global warming has led to environmental change. 72. 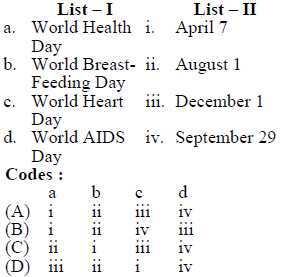 Which of the following deaths are included in computation of neo-natal mortality rate ? 74. Which of the following is not an institutional mechanisms of National Rural Health Mission (NRHM) ? 75. Assertion (A) : Earth can support infinite time of its current population. Reason (R) : Over exploitation of natural ecosystem is the reason for the current natural disasters.